This set of tricky Machine Design Questions & Answers focuses on “Gear Trains”. 1. If driving gear rotates CW, driven gear will rotate? Explanation: If there are even number of intermediate gears between driving gears and driven gears, first and last gear rotate in the opposite direction. 2. If driving gear rotates ACW, driven gear will rotate in which direction? 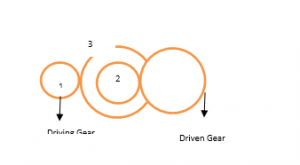 Explanation: Number of idler gears are even, then first and last gear rotate in same direction. 3. A compound gear train consists of at least 3 shafts connected to each other. Explanation: A compound gear train is characterised by one shaft carrying two gears atleast. 4. If driving gear rotates in CW, then driven gear will rotate in? Explanation: 3-ACW,2-ACW and driven gear CW. 5. If centre distance between the two gears on same shaft is unequal to the centre distance on the other two gears on the second shaft, then this gear train is called reverted gear train. Explanation: The centre distance is equal in both the shafts. Explanation: Definition of epicyclic gear train. 7. Which of the following are true about epicyclic gear train? Explanation: Rotating gears are called planet gears. 8. Epicyclic gears are not generally recommended due to bulky construction. Explanation: Epicyclc gears have compact construction. 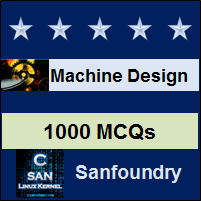 To practice tricky questions on all areas of Machine Design, here is complete set of 1000+ Multiple Choice Questions and Answers.